For most of my life, I’ve been trying to combine three passions: that of teaching, of writing, and of traveling. They’re not exactly opposed to each other, but they often jockey around as my schedule permits: one day, I’m teaching my students document design, the next day, I’m writing a freelance article for someone, and the next day. I’m off writing about an unusual hotel. They don’t often collide–until now. For this consummate bookworm afflicted with perpetual itchy feet whose day job is equal parts writing a dissertation and teaching (well, should be equal parts…. 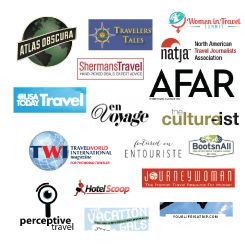 ), I was so excited to find out that I’d been invited to lead a nonfiction writing workshop at the ever-amazing Go Girl Travel Network’s Women in Travel Summit (side note: it’s in Boston from March 27-29th). This year, I’m presenting in the Blogger track. And my topic? Here’s a hint: it’s one of my FAVORITE topics to discuss with my writing students (And one they usually try to avoid at all costs)…. The summit will be held on March 27-29, 2014 in Boston, Massachusetts at the Revere Hotel Boston Common. Tickets (which you can buy here) are $159 for bloggers/writers and $199 for general admission. Oh! And every attendee gets one of these beauties, too.